Dynamic Range is one of the fundamental metrics describing the capability of a shaker controller. You can never have too much dynamic range in any piece of test equipment. Physical realities of a test always “stack up” unfavorably to consume every ounce of available dynamic range a system can muster. It is important that you understand the dynamic range of your equipment, so that you can accurately predict test system performance analytically. This avoids employing time and laboratory assets on a “wing and a prayer” basis, a costly operating philosophy. The test that we will highlight for determining your controller’s dynamic range is a Random Loop-Back Test, which is employing a sequence of stepped demand levels ranging from below the noise floor to the full scale spectral density as shown in Figure 13. To determine the lower limit, the coherence between the Drive and Control is computed. The lower limit is the level prior to the point where the coherence drops below 0.5. The dynamic range measurement is then the ratio of the full scale density over this lower limit. The full scale density for this test is determined by the level where the RMS of the highest band nearly makes the signal peaks reach the full scale voltage. This will happen when √(Densitymax*Bandwidth) = VFS/6 where VFS is the full-scale voltage level, and Bandwidth is the frequency width of the steps used. The implication of this is that the full scale spectral density will depend on the bandwidth used in this test, and as a result, the resulting dynamic range measurement will depend on this same bandwidth used in the test. The narrower the bandwidth used in the test, the higher the maximum density level that can be achieved and therefore the wider the dynamic range value that will be reported. When comparing controllers using this test one must be careful to use the same parameters on both controllers. Figure 14 shows a loop-back random test being run on a VR9500 controller. As shown, 24 Demand PSD steps, each 50 Hz wide, span 115 dB. Control appears to be tight from 3.16 x 10-2 V2/Hz down to 1 x 10-13 V2/Hz, a span of 115 dB. However, the accompanying coherence and transmissibility plots indicate that the noise floor is closer to 3.16 x 10-13 V2/Hz for a conservative Random dynamic range of 105 dB. Note that the coherence is greater than 0.9 all the way down to –105 dB. It is still about .8 at –110 dB where the transmissibility departs from 1.0. Note that this test is run with a Demand PSD that has increasing amplitude steps with frequency. This assures that the lowest amplitude steps in the Control signal reflect the instrument’s noise-floor rather than harmonic distortion. That is, no step of this signal introduces significant harmonics of itself in other steps. At heart, the limits of a controller are determined by the maximum signal level, the noise floor, and the harmonic distortion characteristics of the system. The various measures of dynamic range will depend on these characteristics, but as mentioned in the full paper, dynamic range measurements can vary widely depending on how it is measured, and who is doing the measurement. Because of this, comparisons of controllers using dynamic range numbers are difficult at best. 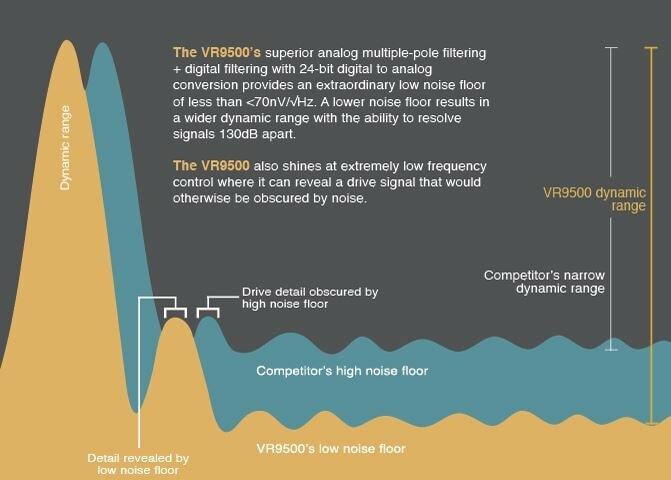 For unbiased comparisons, it is better to compare the maximum signal level, the noise floor, and the harmonic distortion characteristics of the systems.